We greet you once again in the precious Name of our Lord Jesus Christ. On Nisan 9 this year Jewish President Obama will enter the city of Jerusalem "which spiritually is called Sodom and Egypt, where also our Lord was crucified." Is this premeditated satanic mockery? Will he come riding upon a white donkey like the Prince of Peace? Will "many spread their garments and strew his way with branches?" Or will Secret Service forerunners cry, "Behold a pale horse; the name of its rider is Death, he comes in the name of the banksters of the 'City of London,' and Hades follows him closely?" Zechariah 14:1-2 and Revelation 18:21-24 will follow swiftly and the "unbreakable alliance" between Israel and the United States will result in the invasion and defeat of both nations, symbolized perhaps by the melting ice sculpture of Obama on display at Jerusalem's old railway plaza. Please note that Passover, Nisan 14 will fall on March 25 in 2013, while Good Friday will fall on March 29. I do apologize for conflating these two dates for on that day one soon-coming year, the Gentile dispensation will end. Our Main Article this week expounds the mystery of the Millennium Temple. 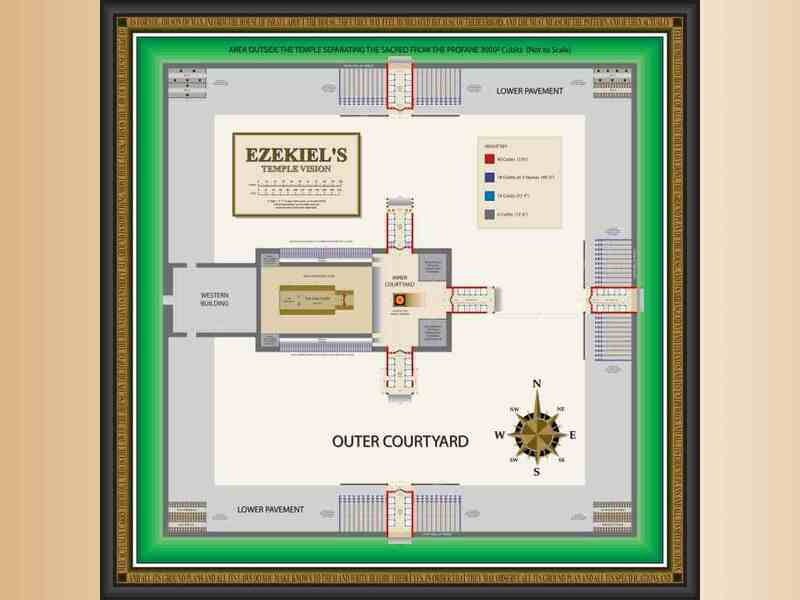 If you do not have diagrams of Ezekiel's temple in your Bible you will find it helpful in study if you print out some of the full size diagrams accompanying this teaching to which you can refer as you "prove all things". March 6, 2013  Code-named "Unbreakable Alliance," the President's visit to Israel will begin with a state reception following his landing in Israel on Wednesday, March 20 (Nisan 9). He will hear speeches by President Shimon Peres and Prime Minister Benjamin Netanyahu. President Obama himself will also speak. The President will then fly to Jerusalem directly to President Peres' residence and visit the Yad Vashem Holocaust Museum and then Mount Herzl, laying wreaths at Herzl's tomb and Yitzhak Rabin's tomb. In the afternoon, he will be hosted at the prime minister's house where discussions will be held about Iran, Syria, the peace process and Jonathan Pollard, followed by a joint press conference. On Thursday (March 21, Nisan 10) President Obama will depart for Ramallah and meet with Palestinian President Mahmoud Abbas. At some point during the day, following a visit to the Israel Museum, examining a model of the Second Temple Period in Jerusalem, and viewing the Dead Sea Scrolls with Netanyahu, the President will also give a public speech to Israelis . . . the Americans have requested at least 1,000 Israelis to be in attendance. The last day of the president's visit in Jerusalem will be on Friday, March 22 (Nisan 11). The president will either breakfast with Prime Minister Netanyahu in his home or at the King David hotel. President Obama will then visit the Iron Dome battery with Netanyahu and meet with soldiers in charge of the battery's operation. Comment: Jesus made his triumphal entry to Jerusalem on Nisan 9, and on Nisan 10 He cursed the fruitless fig tree, a type of apostate Israel, and cleansed the temple of usurious priests. On Nisan 11 the Pharisees and Sadducees sought to trap Jesus in His words while the Gentiles were already beginning to recognize Him. Departing from the temple a disciple remembering His former words, "Now your house is left desolate," and incredulous that it could speedily be cast down he remarked on its massive stones whereon Jesus confirmed His prophecy, adding "there shall not be one stone upon another that shall not be thrown down". Nisan 14 or Passover will be March 25, 2013. Whereas we reckon our days from midnight to midnight the Hebrew reckon from evening to evening so that Nisan 15, March 26 will begin at even on Nisan 14 with the Passover meal and the seven-day feast of Unleavened Bread will commence. The sheaf of firstfruits will be harvested and the Pentecostal feast of Weeks will commence on resurrection Sunday, Nisan 16, March 27, this year, while the Judaeo-Roman Catholic church will celebrate Good Friday upon March 29. March 5, 2013  With African Catholic Cardinal Peter Turkson in the running as the next pope, the media have noted that he carries the fancy title of president of the Pontifical Council for Justice and Peace, an arm of the Vatican. But they have failed to note the existence of a left-wing lobby in the US working feverishly on his behalf. It is the same group of radicals, with connections to [Rothschild] billionaire hedge-fund operator George Soros, who backed Obama for president by claiming he shared their Catholic values. One of Turkson's chief supporters in the US appears to be Stephen Schneck, an associate professor of politics at the Catholic University of America (CUA) and a top official of "Catholics for Obama." He runs CUA's Institute for Policy Research & Catholic Studies and holds conferences featuring left-wing and liberal speakers . . . When Turkson's Vatican's Pontifical Council for Justice and Peace issued a controversial 2011 document, "Towards Reforming the International Financial and Monetary Systems in the Context of Global Political Authority," Schneck called it "breathtaking" and a "Catholic way forward" from the present crisis. Comment: An accomplished polyglot fluent in English, Fante, French, Italian, German, and Hebrew, with understanding in Latin and Greek, Cardinal Turkson has called for the establishment of a "global public authority" and a "central world bank" to rule over financial institutions that have become outdated and often ineffective in dealing fairly with crises, and for a 'Tobin tax' on financial transactions. He notes that "The economic and financial crisis which the world is going through calls everyone, individuals and peoples, to examine in depth the principles and the cultural and moral values at the basis of social coexistence". Might Cardinal Turkson be a genuine black 'Black Pope' who is not a Jesuit? He appears cut out to fulfill Revelation 17:11 and the sequel added to the prophecies of St. Malachy: "In extreme persecution, the seat of the Holy Roman Church will be occupied by Peter the Roman, who will feed the sheep through many tribulations, at the term of which the city of seven hills will be destroyed [in accordance with Revelation 18:4-20], and the formidable Judge will judge his people. The End?" If so, after the 'hot stage' of World War III he will also fulfill Brother Branham prophesy: "I believe, one of these glorious days, when this united confederation of church goes together, and the new pope is brought out of the United States and put over there [in Jerusalem] according to prophecy [Daniel 7:25-25; 8:23-25; 9:27; 11:32-35; Revelation 13], then they'll form an [US and Protestant] image like unto the beast". July 31, 2012  ICAACT was given an exclusive interview with Dr. Barrie Trower, a true British gentlemen and hero, who has spent many years fighting for humanity. During the two days of interview, we touched on many different topics, but the main theme was the abuse of microwaves as a secret and covert stealth weapon, that has been around for at least 50-60 years. This type of weapon has taken many different forms over the years and it is still used in many different types of targeting around the world, even to the point of death. Comment: An injection of sulfur large enough to compensate for surface warming caused by the doubling of atmospheric CO2 would strongly increase the extent of Arctic ozone depletion during the present century for cold winters and would cause a considerable delay, between 30 and 70 years, in the expected recovery of the Antarctic ozone hole. Instead of blaming CO2 emissions and global warming (which has not happened in the last 16 years) for the "unreal" weather on this planet and fighting running battles over who is right and who is wrong in the climate debate, scientists, journalists and the environmental movement should shift their attention to the impact of stratospheric geoengineering. Much of the dispute is caused because this issue is not taken into account. In this context it is noteworthy that just recently the Rothschild dynasty bought a majority stake in Weather Central, a firm specializing in providing dynamic weather graphic systems. The firm has more than 400 broadcast television clients in 21 countries. It provides weather forecasts to millions daily. The Rothschilds have close ties with the Rockefellers. Bringing together control of weather, food and population, as we have seen there are many aspects to Stratospheric Aerosol Geoengineering. Apart from weather and climate manipulation the most worrying is the toxicity. Our weather is natural no more. Our environment is not just toxic and increasingly dangerous, but manipulated in ways most people would never conceive let alone believe. Also see Electronic Magnetic Pulse. February 26, 2013  In the United States everything is polluted. Democracy is polluted with special interests and corrupt politicians. Accountability is polluted with executive branch exemptions from law and the Constitution and with special legal privileges for corporations . . . The Constitution is polluted with corrupt legal interpretations from the Bush and Obama regimes . . . Waters are polluted with toxic waste spills, oil spills, chemical fertilizer run-off . . . The soil's fertility is damaged, and crops require large quantities of chemical fertilizers. The soil is polluted with an endless array of toxic substances and now with glyphosate, the main element in Monsanto's Roundup herbicide, with which GMO crops are sprayed. Glyphosate now shows up in wells, streams and in rain. Air is polluted with a variety of substances . . . All of these costs are costs imposed on society and ordinary people by corporations that banked profits by not having to take the costs into account. This is the way in which unregulated capitalism works. Comment: Another good man murdered for the City of London by the image unto the beast. February 28, 2013  The United States would back Israel militarily if the Mideast ally were to attack Iran in self-defense, a bipartisan group of senators said Thursday in introducing a forceful resolution. "No one wants another conflict anywhere in the world militarily, but we also don't want a nuclear-capable Iran," said Sen. Lindsey Graham, R-S.C., at a news conference. Comment: In George Orwell's 'newspeak' "war is peace" and "military aggression is self-defense." Meanwhile, the Obama administration's hands are awash with the blood of countless innocent Syrians, blood that promises to spill into Lebanon and other neighboring states as the region becomes destabilized along ethnic-religious lines. The stage is still being set, waiting until optimal conditions are met for a Libyan style US/NATO mass-bombing mission to finish the Syrian government. In the eyes of Obama the resulting disaster will be worth the mess, since a non-compliant regime to the US will have been toppled, thus clearing the path for the long term plan of crushing Iran (globalresearch.ca, globalresearch.ca). March 4, 2013  Pictures of DHS Armored Vehicle I took while in Kentucky as it passed me on the road. The US ordered 2,700 of them for US soil. Tennessee State Guard has stopped the vehicles from coming into Tennessee from Kentucky. The shocking part is the troops that were with the vehicles were Eastern European/Russian in DHS uniforms. There are reports that Russian DHS troops in the Smoky Mountain area have stopped and questioned people. Full story: sherriequestioningall, Blue Grass Army Depot 14,600 acre Joint Munitions Command. DHS Purchase 2,700 Light-Armored Tanks to go with their 1.6 billion bullet stockpile. Pictures I took of a DHS Armored Vehicle in Kentucky. Smoky Mountains  UN Biosphere, Homeland Security armored vehicles. Acts 1:6, "When Jesus' disciples came together they asked, Lord, will you at this time restore the kingdom to Israel"? Solomon's temple first became the dwelling place of the Lord when the Ark of the Covenant was set in the Most Holy Place and the Shekinah manifest the Presence of the Lord (I Kings 8:10). But in Ezekiel 10:18  11:23 the seer saw the Shekinah of God's Presence depart; Nebuchadnezzar raised the temple and the Ark of the Covenant disappeared, probably consumed by fire, so that in Zerubbabel's restoration and Herod's reconstruction the Holy of Holies was empty but for the rock (pictured below in es Sakhra, the Dome of the Rock) and the Shekinah never again appeared to the high priest on the Day of Atonement. The vision of Ezekiel 40:1  48:35 was revealed in 574BC and Ezekiel 40–44 describes the temple that is to be built for, not in the Millennium. This symbolical temple will be built on the Rock of New Testament revelation, "a building of God, a house not made with hands, eternal in the heavens . . . for Christ is not entered into the holy places made with hands, which are the figures of the true." Here the Lord God will set His throne in the Most Holy Placethe once stony heart of His servant Israel made flesh and redeemed in one day twenty-six centuries after Ezekiel's vision (Matthew 16:18; II Corinthians 5:1; Hebrews 9:24). Herein Christ and His Bride will be worshipped through the millennium and into eternity (Ezekiel 37:26; Isaiah 49:23; 60:14; Revelation 3:9). The Millennium temple will become God's dwelling which we enter when Israel's blindness is vanquished by their belated revelation that the Shekinah over the Mount of Olives was the sign of Christ's second or 'parousia' Coming to Israel (Deuteronomy 28:28; Zechariah 12:4; Romans 11:25; Matthew 24:3, 30-31). This house will constitute 144,000 elect Israelites (Hosea 6:1-3; Amos 9:9-12; Acts 15:15-17). Zechariah 6:9-13, "The Word of the Lord came to Zechariah saying: Heldai, Tobijah, and Jedaiah will bring gifts of silver and gold from the exiles in Babylon. The day they arrive from Babylon you are to meet them at the house of Josiah (the son of Zephaniah) where they will stay. Accept their gifts and make from them a crown and put it upon the head of Joshua (the son of Josedech) the high priest. Tell him, the Lord of hosts says: You represent the Man who will come, whose Name is "The BRANCH"and He will grow up in His place, and He shall build the Temple of the Lord. It is He who will build the Temple of the Lord. To Him belongs the royal title [Son of David] and He will rule upon His throne [in the millennium] as King and as Priest with perfect harmony between the two offices". Around this time the Judeans were descrying Zerubbabel's restoration which, "in comparison with Solomon's Temple, is as nothing"having no Ark, no sacred fire, and no Shekinahwhereupon the Lord delivered a compound prophecy in Haggai 2:5-9 (and later Malachi 3:1), "When you left Egypt I promised that My Spirit would remain among Israel. Fear not! For THUS SAITH THE LORD of hosts: In a little while I will begin to shake the heavens, and the earth, and the sea, and the dry land—I will shake all nations (Isaiah 13:13), and [the Redeemer, Jesus Messiah], the Desire of all nations [or Gentilesfor Israel "desired Him not" (Isaiah 53:2-3; John 1:11)] shall come, and I will fill this house with My glory [veiled in virgin-born flesh at Christ's first Coming as formerly it was veiled in the Cloud], says the Lord of hosts. The silver is Mine, and the gold is Mine, says the Lord of hosts. The glory of this latter house [through the Presence of Christ] shall be greater than [the silver and gold that adorned] the former [temple of Solomon], says the Lord of hosts: and in this place [Jerusalem] I will give peace [between God and men through the Blood of the Cross (Genesis 49:10; Matthew 12:6)], says the Lord of hosts". The shaking of nations implies judgments of wrath on the foes of God's people, and ultimately the earthquakes that sink Los Angeles and cleave the Mount of Olives before the reign of the Prince of peace (Isaiah 13:13). The kingdoms of the world are but the scaffolding for God's Spiritual Temple, and will be thrown down when their purpose is accomplished. In this mortal life someone has to design the engineering, grow and harvest the food, sew the clothing, build the houses and print the Bibles for God's people. The transient nature of all that is earthly should lead men to desire the 'peace' of Messiah's eternal kingdom (Haggai 2:9; Hebrews 12:27-29). The Judahites hesitated in advancing the work of restoration through dread of the Medo-Persian world power, which was influenced by the craft of Samaria as today the children of Israel durst not return to the land of the Covenant "for fear of the Jews" and the craft of Israelis who boast—"By Way of Deception Thou shalt make War." The prophet assures them Medo-Persia and all other world powers are to fall before Messiah who is to be associated with Zerubbabel's Temple; therefore they need fear nothing. Paul quotes this passage in Hebrews 12:26-27, comparing the heavier punishment awaiting the disobedient under the New Testament with that which confronted rebellious Israel at the institution of the Old Testament when only earth was shaken (Exodus 19); now heaven and earth and all things are to be shaken (Daniel 2:35,44; Matthew 21:44), but Jesus Messiah's kingdom "cannot be shaken." There are many parallels between Ezekiel and Revelation and in the chapters we are studying. I believe Ezekiel represents the 144,000 elect Israelites in the second half of Daniel's Seventieth Week receiving the revelation of the Message of their two martyred prophets of Zechariah 4 and Revelation 11, as throughout the Book of Revelation John represented Christ's end-time Bride, because only the 144,000 will receive the revelation of Ezekiel's symbolic vision when it is quickened by the Spirit after the martyrdom of the two witnesses who expounded their Seven Trumpet mysteries. Ezekiel's temple is the 144,000 Israelites. Jesus Messiah, the Headstone the builders rejected, will be exalted and placed by the ministry of the "two olive branches" of Zechariah 4 anointed with the Spirit that endued Moses and Elijah. Their Message will be quickened"Not by might, nor by power but by the baptism with the Holy Ghost" revealing Christ's 'parousia' Coming and raising a temple not made of stone but stony hearts changed to flesh (Ezekiel 11:19; 36:26; Amos 9:11; Acts 15:16). Psalm 118:22, "The stone that the builders refused has become the head stone of the corner" (Ephesians 2:20; I Peter 2:4-8). God crowns Christ's Bride with grace as the Capstone transforms the Kingdom from a six-sided structure, and six is either four plus twoman's world (4) with man's enmity to God (2) brought in: or it is five plus one, the grace of God made of none effect by man's addition to it, or perversion, or corruption of it: or it is seven minus oneman's coming short of spiritual perfection. In any case, therefore, it has to do with man; it is the number of imperfection; the human number; the number of MAN as destitute of God, without God, without Christ, without hope in the world that is to come. Hereby the Body of the Kingdom becomes God's five-sided holy mountain, so when the Headstone is brought forth to the 144,000 and quickened by faith they will recognize their Lord and King "with shoutings, crying Grace, grace unto it" (Zechariah 4:7); and when they recognize their King they will recognize their Queen, His Wife the Church. Today the Church Age Body of PART-Word saints is sealed into Christ, and the world, including the 144,000 elect Israelites, is shut out and under the spirit of Laodicea which is Judaeo-communism; most of these are souls imprisoned in the breach between the Seals and the Church Age. 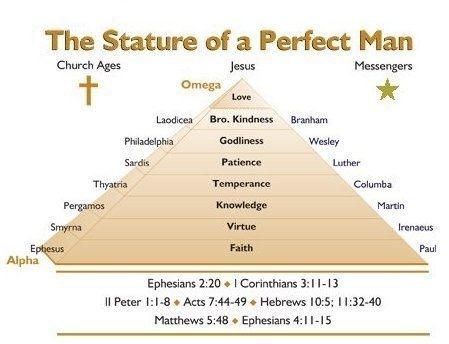 For those of Christ's end-time Bride who are already born-again the Capstone is on the pyramid; they are the "lively stones" of which it is built. This diagram illustrates the "very high mountain" of Ezekiel 40:2 to which the seer (who types the 144,000) has been transported in vision as John (representing us) was caught up in the Spirit into heaven in Revelation 4; figuratively this "very high mountain" is the 1,500 mile high pyramidal form of Mount Zion, the future home of the earthly Bride and the Heavenly Groom in the renewed heavens and renewed earth. It's initial upward movement at the close of the Gentile dispensation will cause the earthquake that cleaves the Mount of Olives in twain, forming a wide valley and demolishing Al Aqsa mosque and the Dome of the Rock on Mount Moriah, "shaking all nations" to the 'hot stage' of World War III. In this vision the City or elect is on this mountain "that fills the whole earth" (Isaiah 2:2; Ezekiel 17:22-23; 20:40; Daniel 2:35; Micah 4:1). From the summit of this Mountain in the renewed earth Ezekiel looks back a thousand years to "the time of Jacob's trouble" in the Seventieth Week as John in Revelation 1:10  3:22 looked back through time from the Day of the Lord to the Seventh Trumpet, seven Church Ages, and to Pentecost. Ezekiel's vision is parallel to that of John in Revelation 21:10, wherein you and I are "carried away in the Spirit to a great and high mountain" where the angel Brother Branham shows us "that great city, the holy Jerusalem, descending out of heaven from God" which will be the Bride of Christ and the elect of all Ages returning to the renewed heaven and renewed earth. 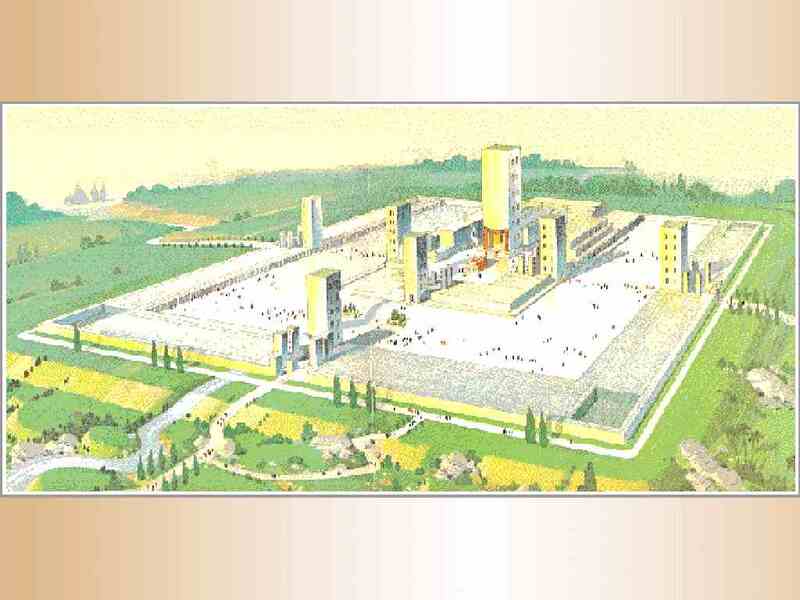 What Ezekiel sees is the millennium temple, signifying the 144,000 elect Israelites. Its square is six times as large as the wall enclosing the old temple, and larger than all of earthly Jerusalem, while the area of the city in Ezekiel is three to four thousand square miles including the ground set aside for the prince, priests and Levites. Revelation 21:17, "And he measured the wall, a hundred and forty-four cubits, according to the measure of a man, that is, of the angel [Brother Branham (Revelation 21:9; 17:1; 1:1)]." 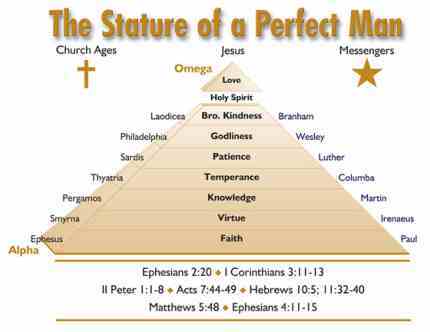 The number six employed in measuring Ezekiel's temple is that of man. Ezekiel 43:13, "These are the measures of the altar in cubits: the cubit is a cubit and a hand breadth." A cubit is the length of the forearm from the tip of the middle finger to the forearm, roughly 17½ inches in Israel, while a "hand breadth" was the full breadth of the hand, three and a half inches, making 21 inches (equivalent to the royal cubit of the Egyptians), and one reed was six cubits. This is not the blueprint of an architectural structure to be erected in the millennium but a form of instruction veiled in allegory and illustrated by symbols intended to transform the rude matter of 144,000 elect Israelites into polished stones, perfect in harmony, proportion and regular character with the Word of God for the Most Holy Placean edifice wherein Jesus Messiah and His Bride can reign and be worshipped through the millennium. The Lord is measuring the character of His servant nation. In Revelation 3:12 Jesus promised, "I will make He who overcomes a pillar in the Temple of My God [which is His Body (John 2:19; I Corinthians 3:16; 6:19; II Corinthians 6:16; Ephesians 2:20-22; I Peter 2:5; Hebrews 3:6)] and he shall go out no more: and I will write upon him the Name of My God, and the Name of the City of My God, which is New Jerusalem, which comes down out of heaven from My God: and I will write upon him My new Name." This agrees with Ezekiel 48:35 where "the name of the City will be The Lord is there" or "Emmanuel, which being interpreted is God with us" (Matthew 1:23), while in Revelation 21:2, 22 it is "New Jerusalem" . . . "for the Lord God Almighty and the Lamb [and by the invisible marriage union, His Bride] are its temple . 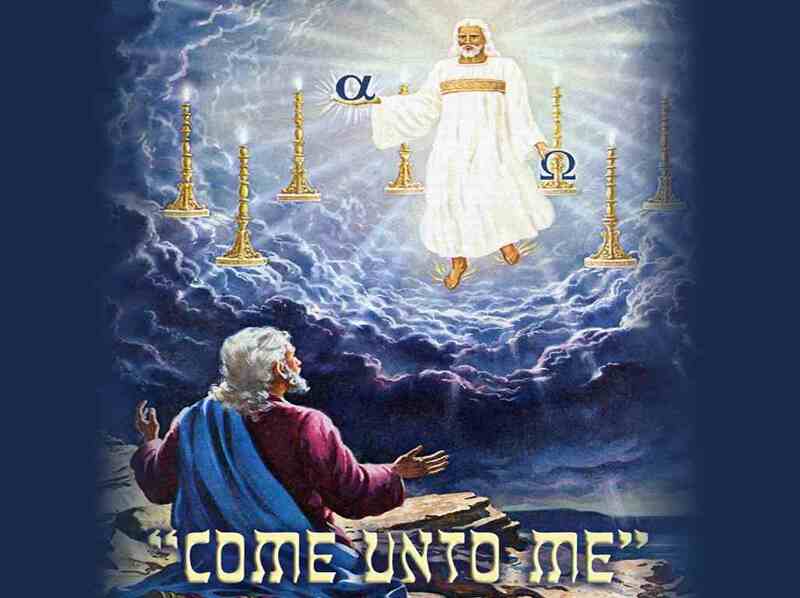 . . that comes down from God out of heaven" and Jesus is Priest King (Ezekiel 37:22). Hebrews 7:1-2, "For this Melchisedec, king of Salem, priest of the most high God, who met Abraham returning from the slaughter of the kings, and blessed him; to Whom also Abraham gave a tenth part of all; first being by interpretation King of righteousness, and after that also King of Salem, which is, King of peace; without father, without mother, without descent, having neither beginning of days, nor end of life; but made like the Son of God; abides a priest forever." Melchisedec was the Lord God Himself manifest in created flesh who was later born of the virgin Mary as Jesus Christ to pay sin's price, conquer death and Hades and rise for our justification. When He died His Bride New Jerusalem was in Him as Eve was in Adam, so you paid for your sins IN Christ on Calvary and were taken from His side in the form of the Holy Spirit from which Christ is making His Bride as Eve was taken from Adam's side in the form of a rib. Being raised and seated IN Him in heavenly places which is the Word, you have eternal Life and cannot come under condemnation (Romans 4:25; 8:1; II Corinthians 5:13-17; Ephesians 2:6; Colossians 3:3). Brother Branham asked you, "Who is THIS Melchisedec"? Who is the King of righteousness? Who is the King of New Jerusalem, the King of Peace?Why, it is the Almighty God, our Brother Jesus Christ! I Corinthians 15:27-28, "For God has put all things under Jesus' feet. But when He says all things are put under Him, it is clear that God who put all things under Him is excepted. And when all things are subjected to Him, then the Son Himself will also be subjected to Him that God may be all in all." For this Temple City overshadowed by the Shekinah will be the Most Holy Place which none but God's elect may enter (Revelation 21:3, 27). In the vision (Revelation 1) the City is signified by "one like the Son of Man" drawn out from seven golden lampstands three cubits high south in the sanctuary in God's Presence. In Ezekiel 40:2, the sanctuary is transformed to a "very high mountain" with the City of God on the south, and below representing Israel, the table of showbread that stood one and a half cubits high is being reinstructed into the millennium temple on the north of the same mountain or Kingdom. Do you see from these shadows and types how the Bible is the story of God changing His form from the eternal Spirit alone with His thoughts, through the spoken Word to the manifestation of His thoughtsAttributes of HimselfSpirit in the flesh of His glorified Family, Jesus Christ and His Bride? In the vision the Lord brought Ezekiel to this mountain in the land of Israel where he encountered a Man in appearance radiant brass with a reed and a line of flax for measuring. This Man was Christ, the Angel of the Lord. I have learned this from the realization that Revelation 11:1-2 properly belongs to Revelation 10. Throughout the Book of Revelation John represents Christ's end-time Bride, so in obedience to the heavenly voice we told Christ the Angel, "Give me the little Book." And He said, "Take it and eat it up . . . And I took the little Book from the Angel's hand, [no second-hand religion for Christ's Bride] . . . And I was given a reed like a rod, and He said, Rise, and measure the temple of God [(Gk.) 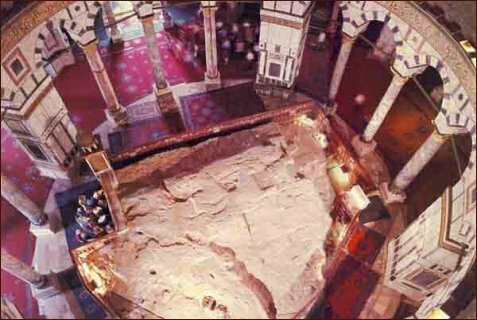 'naos' or sanctuary comprising the Holy Place and Holy of Holies which are one since Calvary], and the altar [of incense], and them that worship in it. And cast out the court which is outside the temple, you shall not measure it; for it was given unto the Gentiles: and the holy city shall they tread under foot forty two months." That is, for the first half of Daniel's Seventieth Week in which God's Covenant in Christ is reconfirmed to Israel (Daniel 12:6-7; Revelation 12:14; 13:5). We encounter Christ again in Ezekiel 40:3-4, "Behold, there [on the "very high mountain"] was a Man, whose appearance was like bronze [(Ezekiel 1:26; 44:2, 5; Daniel 10:5-6, 10:18; Zechariah 2; 6:12-13; Revelation 1:15)], with a line of flax and a measuring reed in His hand, standing in the gateway. And the Man said to me, Son of man, look with your eyes, and hear with your ears, and take to heart all that I shall show you; for you were brought here so that I might show it to you: declare all that you see to the house of Israel". We find the same Man in Ezekiel 43:6-7, "I heard Him speaking to me from the house while the Man stood beside me. He said to me, Son of man, this is the place of My Throne and the place of the soles of My feet, where I will dwell in the midst of the children of Israel forever, and the house of Israel shall no more defile My holy Name, neither they, nor their kings, by their idolatry, or by the corpses of their [idols who held lordship over them as] kings in their high places". We find the same Man in Ezekiel 44:2, 5 as well as in earlier chapters. He appears in Daniel 10:5-6, while in Daniel 7:13 and Revelation 1:13-17 He is no longer alone but united with "One like unto the Son of Man"His Wife drawn out from the seven lampstands into the unity of the faith with the Token of His Life on display. From the first God claimed to be Israel's King both politically and spiritually and had resisted their wish to have a human king as implying a rejection of Him as the proper Head of state. Even when He yielded it was with a protest against the king ruling except as His vice-regent. When Messiah reigns at Jerusalem, He will realize the original idea of the theocracy as its divine-human King reigning in righteousness over a righteous people (Ezekiel 43:12; Isaiah 52:1; 54:13; 60:21). As in Revelation 11:1-2 where the Bride is instructed to measure or judge and separate the sanctified blood Israelites by the Absolute, a reed of THUS SAITH THE LORD; in Ezekiel 40-43 God is reinstructing Israel, restoring them to tribal order in His Presence by the Absolute of obedience in holiness through faith for the millennium under the theocracy (Ezekiel 48). After measuring the sanctuarysignifying the ministry of the two Hebrew prophets of Zechariah 4 and Revelation 11 "reinstructing" the 144,000 Israelitesthe Spirit brings Ezekiel back to the Eastern Gate of the temple. This gate types the entrance to the heart of the elect Israelites, the temple where Christ will take His rest by the baptism with the Holy Ghost, therein to be worshipped throughout the thousand year theocracy and for eternity. Ezekiel 43:2-3, "Behold, the glory of the God of Israel came from the way of the east: and His voice was as the voice of many waters [His wife united with Him (Ezekiel 1:24; Revelation 1:15]: and earth shone with His glory [in the Light of His unseen 'parousia' Coming to Israel radiating from the hearts of the elect Israelites hitherto in darkness (Isaiah 6; 60:1-2) as the revelation of His 'parousia' Coming to us Gentiles had also "lightened the earth with His glory" (Revelation 18:1)]. And the vision I saw was like the vision I had seen when He came to destroy the city and like the vision I had seen by the river Chebar; and I fell upon my face" (Ezekiel 4:1-28). Like Revelation 18:1 this is prospective, as explained by verses 6-7 which we have discussed and the remainder of the Book, the glory of the Lord does not enter the 144,000 until they are fully immersed in the Spirit in chapter 47; not until chapter 48 are they restored in tribal order and the tribal names of Dan and Ephraim recognized for the theocratic rule. I place the chronological setting of Ezekiel 43 at the dispensation change when the sign of Christ's second or 'parousia' Coming to Israel manifests in the form of a Pillar of Cloud over the Mount of Olives (Isaiah 29:6; Zechariah 14:4; Matthew 24:30-31; Acts 1:10-11; Revelation 16:18-19)its significance unrecognized by Israel until after the midst of Daniel's Seventieth Week just as it was many years before Christ's end-time Bride recognized the true significance of the Pillar of Cloud manifest to us. Revelation 7:2-3, "And I saw another angel ascending from the east, having the Seal of the living God: and He cried with a loud voice to the four angels, to whom it was given to hurt the earth and the sea, saying, Hurt not the earth, neither the sea, nor the trees, till we have sealed the servants of our God in their foreheads". This "reinstruction" by the two Hebrew prophets will realize the justification and sanctification of the 144,000, but their new birth cannot take place until after the martyrdom of these prophets in the second half of Daniel's Seventieth week. I realize there are many in the circle of this Message who imagine that Daniel's Seventieth Week is only three and half years. This is because they have neglected to take the "letter" of Brother Branham's Messages back to Scripture from Genesis to Revelation to understand what they mean. "The letter killeth, but the Spirit giveth life" (II Corinthians 3:6); like "those noble Bereans" we must discern between the Logos and the rhema. 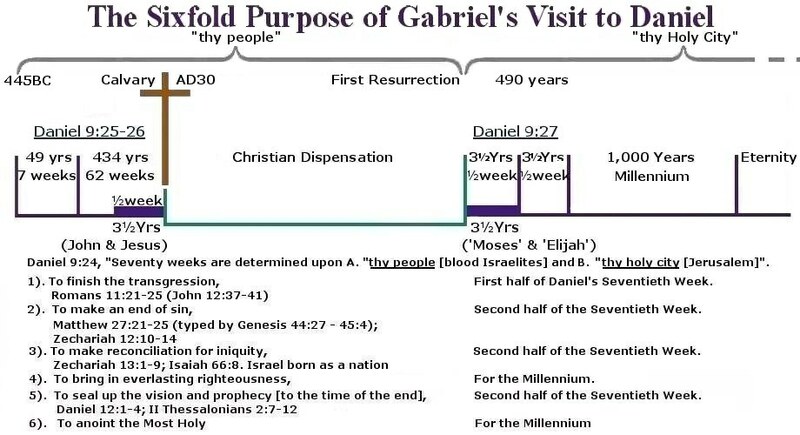 This timeline clearly shows seven full years remain to be fulfilled in Daniel's Seventieth Week. Ezekiel 43:10-11, "Son of man, describe the house to the house of Israel, that they may be ashamed of their iniquities: and let them measure the pattern [and compare it with their own lives] (Ezekiel 36:31-32; Zechariah 12:10  13:9). And if they are ashamed of all that they have done, show them the construction of the house, and its arrangement, its exits and its entrances, and its whole form; and make known to them all its ordinances and all its laws; and write it down in their sight, that they observe the whole constitution and its regulations and do them; [that is, repent]"
The low wall that surrounds the sanctuary and separates it from the profane place (Ezekiel 40:5; 42:15-20) is but twelve feet high, so it is not defensive but proclaims, "You shall be holy, for I am holy." The guardrooms and gates embody the Word: "Without are dogs, whoremongers, murderers and idolaters." The chambers for the people in the outer court preached: "Rejoice in the Lord always and be thankful." The arrangements for the priests reminded of sin and demanded that one should consecrate oneself to God in the burnt-offering, dying to self and mortifying the deeds of the flesh, and always present Him the thank-offering and meat offering of good works. While the altar of incense proclaimed to all: "Pray without ceasing." Ezekiel 43:12, "This is the law of the house; the whole area around the top of the mountain shall be Most holy. This is the law of the house". This superlative, which had been used exclusively of the Holy of Holies (Exodus 26:34), was now to characterize the entire building. This all-pervading sanctity was to be "the law of the [whole] house," as distinguished from the Levitical Law which confined the peculiar sanctity to a single apartment of it. In the restoration of the kingdom to Israel, their divine King occupies that fleshly house of the 144,000 as His throne conditional to them putting away sin and giving Him preeminence in their hearts. The law of the house consists in the whole region of the pyramidal temple mount being holy (foreshadowed by Mount Horeb in Exodus 19:12-13). It is the "high place" of Godnot a high place of gods. The remainder of the chapter pertains to the consecration of the altar of sacrifice where the people offer their sacrifice of faith and praise. This signifies the entire surrender and consecration of the people to the Lord, whereby they present themselves to Him and enter into grace that He may re-occupy. The justified man lives henceforth not to Himself. Ezekiel speaks of a sacrificial altar and burnt offerings; but in the millennium "The wolf and the lamb shall feed together, and the lion shall eat straw like the bullock: and dust shall be the serpent's meat. They shall not hurt nor destroy in all My holy mountain, saith the Lord" (Isaiah 65:25; 11:9). Thus the altar is an allegory for consecration, sanctification, and separation from ungodliness. The bronze laver is absent from Ezekiel's temple since Israel's sin has been remitted (Revelation 15). Satan will be bound for a thousand years so there will be no sin, besides which, the Glorified saints are immune to sin. The golden furniture of the tabernacle and temple is also missing from Ezekiel's Temple. The golden lampstand has been transformed into Jesus Messiah's glorified Wife"the holy City, New Jerusalem coming down from heaven as a Bride adorned for Her Husband" (Revelation 21:2). Jesus said of us, "You are the Light of the world. A city that is set on a hill cannot be hid" (Matthew 5:14). The permanent temple is "the Lord God Almighty and the Lamb" (Revelation 21:22), as Paul says, "You are the temple of God" an enduring, eternal temple (I Corinthians 3:16; Revelation 21:3) wherein the Presence of the Lord, formerly represented by the Angel of the Covenant and the Pillar of Cloud, will dwell and be worshiped by the "saved" throughout eternity. "And nothing unclean nor anyone practicing immorality and falsehood shall ever enter, but only those who are written in the Lamb's Book of Life" (Revelation 21:27). The Table of showbread (or bread of the Presence) is transformed into the millennium temple, one nation of 144,000 glorified Israelites, "a house of prayer for all people" (Isaiah 56:7) wherein King Jesus Messiah and His glorified Bride from all nations will be enthroned when He "gives them one heart filled with a new spirit; and takes the stony heart out of their flesh, and gives them a heart of flesh" (Ezekiel 11:19; 36:26; Mark 11:17). In contrast to "I the [temporary] little sanctuary" of the exile (Ezekiel 11:16); when the two nations are united into one kingdom under David's greater Son "I will set My sanctuary in the midst of them for evermore. My dwelling place shall be with them: and I will be their God, and they shall be My people. And the nations [of the "saved] will know that I the Lord sanctify Israel" (Ezekiel 37:25-28). Ezekiel 40-48 is "the restoration of the Kingdom to Israel" after which the disciples inquired in Acts 1:6. The altar of incense is extant and larger than of old, but it is now a plain wooden form (Ezekiel 41:22; 44:16) indicative perhaps of our humanity, and foursquare indicating the universality of "worship in Spirit and in truth"divine revelation. It signifies ceaseless worship, as in the temple and tabernacle incense burned continuously (I Thessalonians 5:17), and although there will never be intercession or another prayer for the sick, Jesus remains the same forever and will be revealing the blessings of His Word throughout eternity. The words "incense" and "prayer" are used interchangeably (Psalm 141:2), and in Revelation 8:3 "much incense [of the Seven Thunders, which is the revelation of the Seventh Seal] was added to the prayers of all saints in the Church of all Ages" to remove the offense of human error and bring our several and collective revelation into oneness with the mind of Christ. This, too, is fulfilled in our oneness in the Spirit. The veil separating the royal priesthood from the Holy of Holies is also missing from Ezekiel's temple as it represents Christ's Body: "when He yielded up the ghost the veil of the temple was rent in twain from the top to the bottom" (Matthew 27:50-51; Hebrews 10:20). Since we are in Christ who is "the door into the sheepfold" (John 10:1) we have even now in this mortal life entered into the Holy of Holies by hope through faith. Also absent in Ezekiel's temple is the Ark of the Covenant (Jeremiah 3:16-17), which has been transformed into King Jesus Messiah (Revelation 11:19). Henceforth the first God-Man will be "dwelling in the midst of Israel forever" (Ezekiel 43:7). Chapter 44 contains ordinances for the prince or civil governor and for the priests, the two classes through whom directly the former pollutions had been introduced into the House of God. Ezekiel 44:22 speaks of marriage, however "those who are accounted worthy to attain to that age and the resurrection from the dead neither marry nor are given in marriage, for they cannot die any more but are like the angels, and as sons of the resurrection they are God's sons" (Luke 20:35-36). Ezekiel 44:25 speaks of "dead persons," however there will be no death in the millennium as all possess glorified bodies. These elements further confirm Ezekiel's temple is an allegory and not an architectural edifice. The natural types the Spiritual, and the Old Testament shadows and types are evidence of the substance of faith and a promise of "things not seen." The natural tabernacle and temple are a type of the kingdom of God and the redeemed individuals who will comprise the theocracy. The Outer Court of the tabernacle represents your first step in grace where you receive the revelation who the Lord Jesus is; not three in one or six of one and half-a-dozen of the other, but the One person of God born of a virgin to fulfill the part of Adam's KINSMAN Redeemer and vicariously pay the wages of sin. Here by grace through faith you receive Him as your Saviour, repent of past unbelief and take His Name as your body is baptized by immersion in the laver for the remission of past sins as the sacrifice had to be washed before it was offered. Following obedience your sacrifice of faith is as it were consumed on the brazen altar, and you are accounted justified by grace through faith. Your second step by grace through faith is sanctifying your mortal spirit to bring your memory, conscience, imagination affections and reasoning subject to the Word and will of God, enabling you to take charge of what you see, listen to, taste, touch, feel and say. Ordering your life to God's standard of holiness you approach the altar of incense in the Holy Place. Sanctification will continue throughout your daily life to keep you unsullied by the world. Your third step is the baptism with the Holy Spirit through a life manifesting the Word for your day. This quickens your soul to new birth, seals you in Christ unto the day of your physical redemption and initiates your growth to maturity in the unity of the faith in preparation for the manifestation of the Sons of God and the translation. Spiritually you are now in heavenly places in Christ Jesus, beyond the veil in the Holy of Holies as it were, growing in grace and bringing the ten senses of your mortal spirit and corruptible flesh under preeminence to Christ the Word and Husband of your soul so that the Token affirming His Life in you is on display as a written epistle of the Word for this hour. Brother Branham said, "When you once see the Message of the hour, there's nothing else you can see but that. That's all. Everything else is gone; the rest of it's just a filler when you once see the Message." Jesus said, "All the Father has given Me will come. And no man can come except My Father has called him." So it's just for that elected group that's been called." "The Message will go forth, but it will just go right on over [people's heads]. Just like He said, "Some fell by the wayside, and some this way, but some went over." And a lot of its just filler, to fill in the time. Millions of people that's professing Christianity will miss it a million miles." 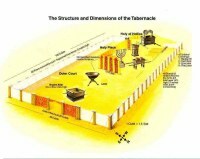 You can see from the diagrams how the three divisions of the tabernacle and temple are a natural type of the saint of God. The tabernacle and temple, their furniture and service of worship were symbols of redemption directing Israel back into God's favour and Presence; back to the bosom of Christ and the holy City, New Jerusalem on the holy Mount in a restored Eden. You are the true temple of God. Let's see where Brother Branham taught these things. The Lord determined He would deal with the Israel nation and their holy city in grace for Seventy Weeks of prophetic years, 490 years commencing in 445BC from the going forth of the commandment of King Cyrus to build and restore old Jerusalem (Nehemiah 1:1-2:8), and concluding with the dedication of the millennium temple which will be Israel's new birth in one day (Isaiah 66:8) by their revelation of Christ's unseen second or 'parousia' Coming anointing the Most Holy Kingdom. Then the millennium will set in; thereafter King Messiah will cleanse old Jerusalem, purge the earth of sin and sinners and bind Satan. In the seventieth week of seven prophetic years of 360 days the Lord will achieve His sixfold purpose which is to sift and transform an election of 144,000 Israelites and restore the Kingdom to their holy city. Namely, "to finish the transgression, make an end of sins, make reconciliation for iniquity, bring in everlasting righteousness, and to seal up the vision and prophecy, and to anoint the Most Holy Place" (Daniel 9:24). "The Most Holy Place" is where the Lord was enthroned on the Ark of the Covenant in the Holy of Holies that once hid God's 'Rhema' inscribed on stone tablets behind shittim wood crowned with a golden Mercy Seat, above which and facing the Presence were golden cherubim signifying Israel's great prophets (Zechariah 4:14; Luke 7:28) who introduced the 'rhema' of Law in stone and grace in Jesus Messiah whose virgin-born flesh would veil the Logos in the many-membered form of New Jerusalem, His Bride, the last Eve. The Most Holy Place will be anointed when the 144,000 enthrone Jesus Messiah and His Wife in their hearts as King and Queen by their belated revelation of His 'parousia' Coming to Israel. We will take our place in the millennial temple when Israel is born as a nation in one day (Isaiah 66:8). Ezekiel 43:1-6, "After [measuring the priest's chambers] He brought me to the gate facing east: and, behold, the glory of the God of Israel came from the east: and His voice was like the voice of many waters: and earth shone with His glory." "And it was according to the appearance of the vision which I saw, even according to the visions that I saw when I came to destroy the city [Ezekiel speaks as God with reference to the destruction of the temple by Nebuchadnezzar (Ezekiel 1:4-28), NOT Titus (Ezekiel 9:1, 5)]: and the vision was like unto the vision that I saw by the river Chebar; and I fell upon my face. And the glory of the Lord came into the house by the way of the gate whose prospect is towards the east." "So the Spirit took me up, and brought me into the inner court; and, behold, the glory of the Lord filled the house. And I heard Him speak to me out of the house; and the Man stood by me". 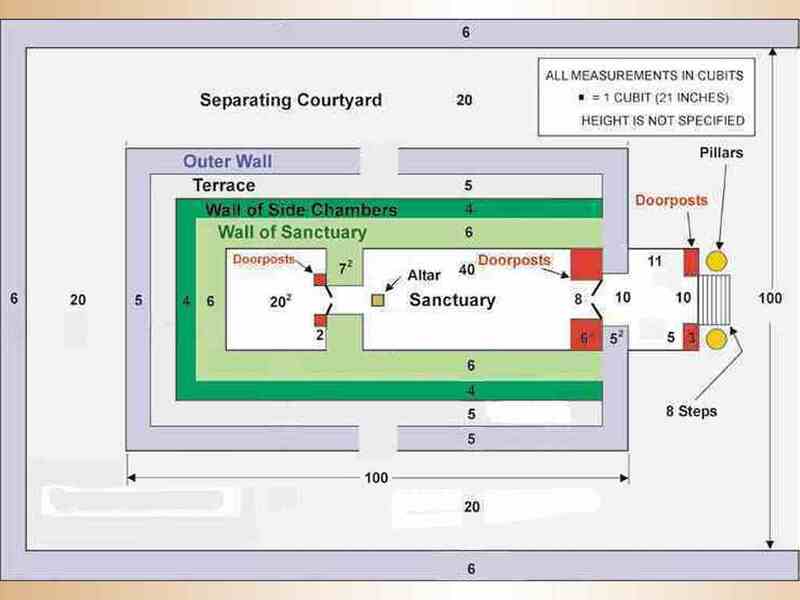 [In plain English the measuring of the house within the Outer Courtyard begun in Ezekiel 40:3 is now finished and the Prophet is led back through the Eastern Inner Gate and across the Outer Court to the Eastern Outer Gate and he measures around the wall enclosing the Outer Courtyard from the outside, beginning at the east side, foursquare, five hundred cubits (not reeds) per side]. Anointing that Temple for the Millennial reign . . . Now, watch how it was dedicated in Leviticus 8:10-12 . . . "And Moses took the anointing oil, and anointed the tabernacle and all that was therein, and sanctified them. And he sprinkled thereof upon the altar seven times . . . anointed the altar and all the vessels, both the laver and his foot, to sanctify them. And he poured . . . anointing oil upon Aaron's head, and anointed him, to sanctify him". Moses in the wilderness sanctifying or anointing the tabernacle of worship for the children of Israel when they were in their journey . . . It was anointed. "And it came to pass, as the trumpets and the singers were . . . to make one sound to be heard the praising and thanksgiving of the Lord; and when they lifted up their voices with the trumpet and the cymbals and the instruments of musick, and praising the Lord, and singing, for He is good; and His mercies endure forever: that then the house was filled with a cloud, even the house of the Lord; So that the priests could not stand to minister by reasons of the Cloud: for the glory of the Lord had filled the house of God". God came into the sanctuary that was to be anointed and was given over to Him for the people to come to worship. So to anoint not thy holy place, but to anoint the Most Holy Place . . . And we notice that New Jerusalem is the Most Holy Place, and the anointing will be upon the New Jerusalem that descends from God out of heaven, prepared as a Bride adorned for her Husband. The anointing will be upon them. Now, when Zerubbabel dedicated his temple after it was rebuilt, it was not anointed again, because it was already been anointed, and been tore down, or it was just instructed again. The destruction had come to it. It had been instructed again and put up, so there was no anointing of it anymore. When it was one time anointed, that carried on through, and it goes on till this very time. But when God sets up the Millennium Tabernacle, He will anoint the Most Holy, not thy holy, but the Most Holy. But when the King takes His throne for one thousand years . . . Glory she's over now. The anointing of the Most Holy will be the last thing take place. When the Tabernacle is erected, the resurrection [and translation of Christ's Bride of all Ages] has come, the Jews [he means Israelites, NOT Jews] has returned, Christ and His Bride has come, the Jew, the 144,000 are sealed, the millennium has taken place, there will be an anointing when the Most Holy Place will be anointed, the Holy, holiest of holies, and the most Holy, when . . . The Most Holy Place is a sanctuary where God lived between the Cherubims, and this time Christ will set in the Most Holy Place with the anointing upon Him. And they'll need no sun there, for the Lamb in the midst of the City shall be the Light. The sun will never go down in that City, as old Uncle Jim used to say. And it never will, because Christ will be that Light, the anointed One. And the King will come and take His throne for one thousand years to reign. Jeremiah 3:12-18 inclusive, let's read it . . .
"Go and proclaim these words towards the north, and say, Return, thou backslidden Israel, saith the Lord; and I will not cause My anger to fall upon you: for I am merciful, saith the Lord, and I will not keep anger forever. Only acknowledge thine iniquity, that thou hast transgressed against the Lord thy God, and has scattered thy ways to the stranger [committing idolatryspiritual fornication] under every green tree, (That's what they've done from east, west, every nation. See?) . . . and ye have not obeyed My voice, saith the Lord." "And I will give you a pastor according to thine heart, which shall feed you with knowledge and understanding. And it shall come to pass, when you be multiplied and increased in the land, in those days, saith the Lord, they shall say no more: The Ark of the Covenant of the Lord: neither shall it come to mind: neither shall they remember it; neither shall they visit it; neither shall it be done any more. At that time they shall call Jerusalem the throne of the Lord; (As He'll be there. See?) and all the nation shall gather (Hallelujah) unto it, and the Name of the Lord, to Jerusalem: neither shall they walk any more after their own imaginations in the evil of their heart. That's when that City will be anointed. That's when the New Jerusalem will be anointed . . ."
[Continuing from page 75:131-135]. "Isaiah 65, let's begin with about the 17th verse. Listen, everybody, close now. This is during the time of the millennium when the Most Holy is anointed. "For, behold, I will create new heavens and . . . new earth: and the former shall not be remembered, nor come into mind. But be . . . glad and rejoice . . . even in that which I create: for, behold, I create Jerusalem . . . (That's the New Jerusalem) . . . a joying, and her people a joy . . . (What is the anointing? The joy of the Lord [through revelation]) . . . create Jerusalem a joy, and her people a joy. And I will rejoice in Jerusalem, . . . (The King in the throne on the royal majesty of the throne, the eternal throne and the eternal people with an eternal joy in an eternal city. Oh, my)"! "And I will rejoice in Jerusalem, and joy in My people: and the voice of weeping shall be no more heard in her, nor the voice of crying. There shall be no more thence . . . infant of days, nor an old man that has not fulfilled his day: for the child shall die a hundred years old; but a sinner being a hundred years old shall be accursed." "And they shall build houses, and inhabit them; . . . they shall plant vineyards, and they shall eat the fruit of them. They shall not build, and another inhabit; . . . (That is, you die, and your son take your place) . . . build and another inhabit; they shall not plant, and another eat thereof: for as the days of a tree shall the days of My people, and My elect long shall they enjoy the works of their hands. They shall not labour in vain, nor bring forth for trouble; for they are the seed of the blessed of the Lord, and their offsprings with them." "And it shall come to pass, . . . before they call, I will answer; . . . (That glorious anointing in behind the Cherubims) . . . I'll answer; and while they are yet speaking, I will hear. The wolf and the lamb shall feed together . . . the lion shall eat straw like the bullock: the dust shalt be the serpent's meat. And they shall not hurt nor destroy in all My holy mountain, saith the Lord. (Can you miss it? No)". "Jerk right back here again, and Isaiah speaking again at the 11th chapter, the 1st verse to the 9th. Listen what he says here again when he catches the vision after he sees the women, the way they'll be acting in the last days . . . ? . . . [As God confirmed to Brother Branham in the vision he shared in his sermon, "The Masterpiece." Isaiah 11 to 1. "And there shall come forth a rod out of the stem of Jesse, . . . a Branch that shall grow out of his roots: (Who was that? Christ) . . . out of his root: And the Spirit of the Lord shall rest upon Him, the spirit of wisdom of understanding, the spirit of counsel . . . might, the spirit of knowledge and . . . the fear of the Lord. And shall make Him of quick understanding in the fear of the Lord: and He shall not judge after the sight of His eyes, neither . . . after the hearing of His ears: but with righteousness shall He judge the poor, and reprove their iniquity for the meek of the earth: and He shall smite the earth with the rod of His mouth, and with the breath of His lips shall He slay the wicked. The righteousness shall be the girded of the loin, and the faithful the gird of the reins." "And the wolf also shall dwell with the lamb, and the leopard shall lie down with the kid; . . . (That's a goat) . . . and the calf and the young lion and the fatling . . . together; and a little child shall lead them . . . the cow and the bear shall feed; their young ones and shall lie down together: and the lion shall eat straw like an ox. And the suckling child shall play upon the hole of the asp, and the weaned child shall put his hand in the cockatrice' den. They shall not hurt or destroy in all My holy mountains: for the earth shall be full of the knowledge . . . as the water covers the sea". That's in that New Jerusalem, that new . . . Branch here is referred to of the Branch of David. He's both Branch and Offspring. Now, after this the Bride appears. After the seventy weeks, the Bride appears in Revelations the 19th chapter, the 1st and the 16th verse. She arrives with her Bridegroom, the mighty King. Oh, my. I don't know whether we're going to get it all or not. Just got it so . . .
Let's just read part of this anyhow. Here's where the Bride will come, after this. See? After the millennium sets in, then Christ comes back with the Bride. Right. One to sixteen in the 19th chapter. . . And after these things: (After this tribulation, after the Woes, after the Seals, after the Plagues, after the casting out of Satan, after the setting up of the Millennium. Watch)! ". . . after these things I heard a . . . voice of much people in heaven, saying, Alleluia [Heb. ]; Salvation, and glory, . . . honour, . . . power, unto the Lord our God: For true and righteous are Thy judgments: for He had judged the great whore, which did corrupt the earth with her fornication, and has avenged the blood of His servants at her hand. And again they said, Alleluia. And her smoke rose up forever and ever . . . (That's the old prostitute church) . . . her smoke rose up . . . And the four and twenty elders and the four beasts fell down and worshipped God that set upon the throne, saying, Amen; Hallelujah. And a voice came out of the throne, saying, Praise our GodPraise our God, all ye His servants, and ye that fear Him, both small and great." "And I heard as it was the voice of a great multitude, (Listen. Here you are, church. After She went up in the third chapter, here She comes. See?) And I . . . (The sixth verse) . . . And I heard as it were the voice of a great multitude, and as the voice of many waters, and as the voice of a mighty thundering, saying, Hallelujah: for the Lord God omnipotent reigneth. (Hallelujah. Watch. The marriage of the Lamb comes now. Here She comes). Let us be glad and rejoice, and give honour to Him: for the marriage of the Lamb is come, and His Wife has made Herself ready. (Here She comes, both Bride and Bridegroom). And to Her was granted that She should be arrayed in fine linen, clean and white: for the fine linen is . . . righteousness of saints. And he [Brother Branham] said unto me [John, who represents Christ's end-time Bride]: Write, Blessed are they which are called unto the wedding supper of the Lamb. And he said unto me. These are . . . true sayings of God. And I fell down at the feet to worship him. And he said unto me, See thou doeth it not: I am of thy fellowservant, . . . thy brethren and have the testimony of Jesus: worship God: for the testimony of Jesus is the spirit of prophecy." "And I saw heaven opened [i.e. a vision], and . . . a white horse; (Oh, my) . . . and He that set thereon . . . was called Faithful and True, and . . . righteousness does He judge and make war. And His eyes was as flames of fire, and . . . His head was many crowns; . . . (He was crowned what? King of kings) . . . and He had a Name written, that no man knowed, but . . . himself. And He was clothed with white vesture dipped in blood: and His Name is called The Word of God . . . ("In the beginning was the Word, and the Word was God; and the Word was made flesh and dwelled among us." Who was it? Jesus) . . . and His Name is called The Word of God. And the armies which were in heaven followed Him upon white horses, clothed in fine linen, white and clean. (Glory. Here He comes). And out of His mouth will go a sharp sword, and that . . . it . . . should smite the nations: and . . . shall rule them with a rod of iron: and He treadeth the winepress of the fierceness of the wrath of Almighty God. And He had on His vesture and on His thigh a Name written, KING OF KING, AND LORD OF LORDS". What was it? His people [Israel] had just crowned Him King of king and Lord of Lord [by their revelation of His second or 'parousia' Coming to Israel in the second half of Daniel's Seventieth Week, after the martyrdom of the two witnesses, and more than three and a half years after the manifestation of Zechariah 14:4, Matthew 24:30, and Revelation 16:19], coming back to His holy Temple, anointed with the Presence of God to live and to reign through the millennium with His Church. Amen. The appearing with the mighty King to take Her place at His side, the new royal anointed Temple. Now, the sixfold purpose of Revelations 6:1 to Revelations 19:21 is fulfilled". [End of quoting]. You see, "the millennium sets in" with the new birth of the 144,000. Israel's recognition of Christ and His Bride will be their belated revelation of our unseen parousia Coming, not the thousand years of peace which is more than three years distant. For the enforcement of the mark of the beast will have scarcely begun, the 144,000 have yet to be martyred, Vatican City State and the United States of America have yet to be annihilated, while Armageddon and the consummation of life are years future.